Details relating to the Slovakian Commemorative of 2015. 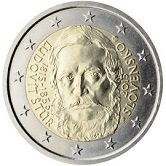 This coin commemorates the 200th birthday of Ĺudovít Štúr. Štúr was a Slovakian linguist, writer and politician. As a respected linguist he did much to raise the “middle-slovakian” dialect to what is now acknowledged the Slovakian literary language. He was elected to the Slovakian parliament where he championed Slovakian interests. The motif for the coin is simply a portrait of Štúr placed centrally within the inner circle. Around the edge of the inner circle on the left side are the name “ ĹUDOVÍK ŠTÚR” and his birth and death years 1815-1856. On the right side we see the name of the issuing country and the year of issue – SLOVENSKO 2015. Preceding and following the country name are the initials of the designer and the mint mark. From Slovakian Commemorative 2015 to euro coin collector.